Funnily enough, I couldn't find any ratings or reviews for the original BBC version of Evil Dead, but for the other two, it seems we're really digging into some deep dirt here. The Spectrum version has been given 9 votes so far, with a score of 4.78 at World of Spectrum. Somehow, I think it's more hilarious than sad that the C64 version has 16 votes at Lemon64, with a score of 3.2. You can't get much deeper than that. But is it truly that bad, then? 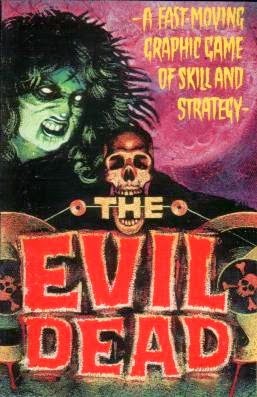 It seems to be an often overlooked fact, that The Evil Dead was the first game ever published by the company many of us would come to recognize from such classics as Barbarian - The Ultimate Warrior, the two Cauldron games and The Sacred Armour of Antiriad. The published in question is Palace Software, which was a subsidiary of Palace Pictures, the film's distributing company in the UK. This overlooking problem might have a lot to do with the fact that the game was originally released for the Acorn BBC Micro, which to my knowledge was not very known outside of the United Kingdom; and the Spectrum version never got a proper standalone release - instead, it was stuck to the b-side of Cauldron as a freebie. So, in a way, it serves some more purpose in gaming history than any of us have ever given it credit for. As strange as it might sound at first, The Evil Dead (the computer game) is a top-down 2D action game with some adventuring elements, something in the vein of Gauntlet and Atic Atac. Just like the movie the game is based on, the game is set at the infamous cabin in the woods, containing the Book of the Dead somewhere within it. You control Ash, and your job is to close windows to prevent the evil monsters from entering, while also killing monsters already inside the cabin. You need to pick up various weapons with which to kill all the monsters, including shovels, axes and shotguns, and while you use the weapons, your energy level decreases, so you need to continuously pick up new weapons in order to increase your energy. The ultimate objective in the game is to obtain the Book of the Dead and destroy it. In every aspect, the game is very much an underwhelming experience, especially if you have put any sort of expectations on it. For what it is, The Evil Dead is certainly a curious piece of entertainment software, and as usual with horror/action games of old, not very successfully done. You could consider it a fairly good low-budget attempt, but it's another one of those games that you will more gladly have a few laughs at than have a proper gaming experience with. Only if you're a horror game fanatic, you should try it out for its historic (lack of?) value, but perhaps everyone else should leave it alone. 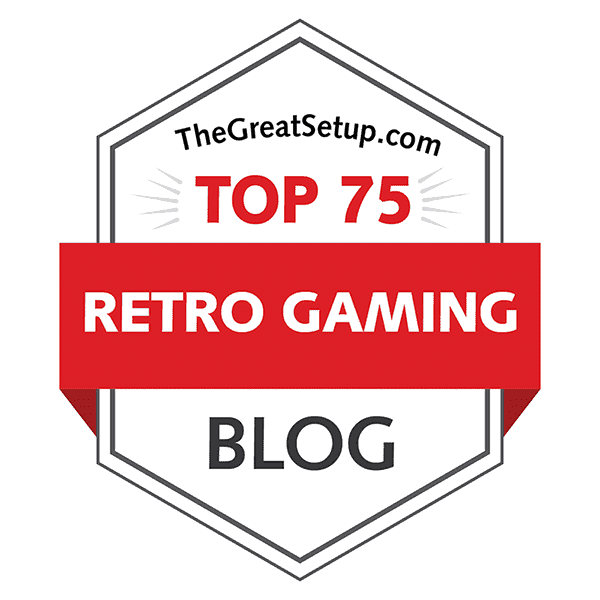 Those of you who know are even the least bit familiar with one of the versions of the game, are likely to be familiar with it through either C64 or Spectrum. In both cases, the game loads all at once, but the original BBC Micro version loads in multiple sequences, before you get to the actual game. Whether it actually adds to the overall quality of the game can be argued. Although the C64 version is easily the quickest of the lot, it also has the least to show, having only a full screen multi-colour horizontal bars kind of a thing. 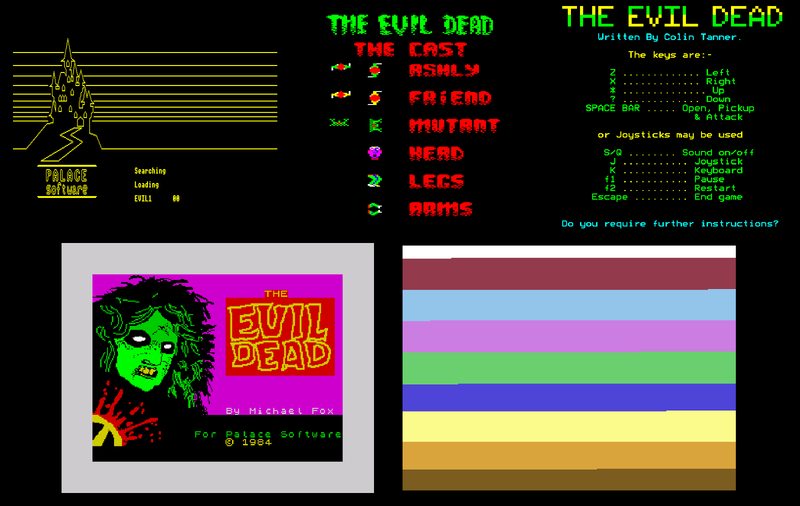 The SPECTRUM version at least gives you two different screens, of which the first is only a simple text indicator of the game being loaded, and the second one being the one you see above of Evil Cheryl, as seen on the game cover. As a nice bonus, the proper loading screen comes in with a brief flashy effect. Curiously, the BBC version has easily the most showy loading sequence. First, we get a very nice full screen representation of the Palace Software logo, which is drawn on the screen with a very particular way. When the tape stops for the first time, we get the controls shown, as well as the option to view the plotline and other information, but the control screen stays on the screen for a while, before yet another loading screen comes on, this time showing you all the enemies and the friendly characters. Finally, the loader goes back to the controls screen, so it's no wonder that the BBC version takes so long to load up. It's nice to look at all the screens not featured elsewhere, but I don't really know if any of it is so useful that it couldn't have been omitted, and the controls screen featured in the main game program. Oh well, at least the Acorn has the choice of a floppy disk version. Let's start with a curious notion: this game features a rarely seen attract modes in a non-arcade game. It's curious, because the game isn't particularly attractive, nor does it serve the purpose. But it's funny that this particular thing is where you will probably find the most difference between all three versions. 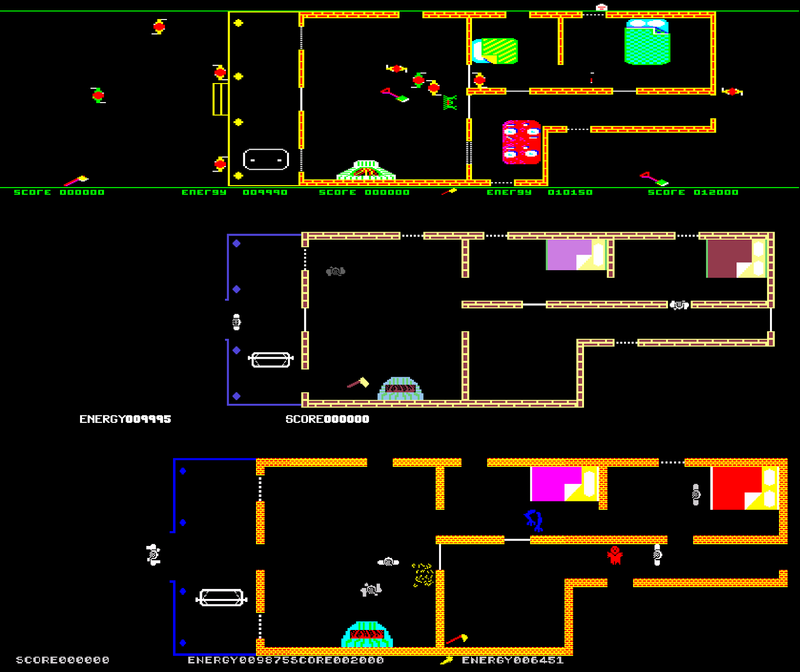 The original BBC MICRO version just shows a basic in-game action demonstration; the SPECTRUM conversion scrolls (and I use that word very loosely) through the area back and forth, showing some random characters roaming around inside the house; and the C64 conversion features something rather unexpected - it's the plotline and instructions, as told by Ashly himself, while walking around the area, and being surrounded by his friends, who turn into monsters later on. It's nice to watch through once, with all the choreography, but the lack of randomness wears it out during that one run. What the instructions tell you is basically this: your movement is restricted to the four main directions, and the designated fire button performs your attacks, picks up weapons and shuts and opens doors and windows. You can kill your friends, but you should avoid it, because doing anything will drain your energy, and this helps not at all. Killing the enemies helps, as does collecting new weapons. After getting a certain amount of score, the Book of the Dead will appear somewhere in the area, and you have to pick it up and throw it into the fire. I have never gotten this far, and I doubt anyone else has, apart from the game creators, perhaps. It helps to know, though, that killing the misty cloud sprite of evil source will very likely only kill you in process, so it's wiser to steer clear from it. Strangely, though, this evil cloud doesn't appear in the original version at all, which gives the game a more random, and perhaps that way, a slightly more evil appearance to all the happenings. It should be noted that the game isn't all that difficult to play; you just need to get used to the bad, sometimes criminally unresponsive controls. The main problem is your alignment and turning ability in certain places, but you can learn your way around these problems pretty easily. Another problem is that all the weapons are to be used in your immediate proximity, and since the character animation is very primitive, it makes the fighting more of a guesswork than it should be. Also, positioning your character for dealing with windows and doors can be aggravatingly precise, but at the same time, random. If it weren't for the SPECTRUM version's support for the Currah MicroSpeech module, there would be no notable differences in controllability. The support code often results in control problems, such as sudden involuntary movements, which are very much evident in here, as if the already uncomfortably basic controls weren't bad enough. The NPC behaviour is very much the same at least in all three versions. There is one design difference in the ACORN original to the other two: the dining room, which actually features a dining table and another window. It does give the cabin some more atmosphere and illusion of being a building used for living, but considering your actions, it will mostly just be in your way. Another notable thing could be said of the SPECTRUM version: it gives you four lives instead of three. Okay, there is some slowdown to be noticed on the Speccy, whenever there is more NPC's on the screen than there is of you. All in all, there is not a whole lot to complain about separately from any of the others. Being as it is, I think all the versions of the game play just as badly, but the evil cloud - or more particularly, the lack of it gives the original a slightly more frightening overall feel. The roaming cloud of evil just feels more comical than frightening, and once you realize you can't really do much else but to avoid it, it only feels more annoying than dangerous. For this reason, the BBC original will take the higher place. It's funny how these early graphic-based horror movie based computer games have very little to offer in terms of graphics. Of course, you can clearly see that The Evil Dead is an even earlier title than Friday the 13th, but there are earlier games that look better, and create a more frightening atmosphere. So the question goes: how do these relatively rough and primitive graphics serve the game? Well, it could be argued that we have another case of funny awfulness here, as we did with our previous entry. The Evil Dead, the movie, offers a nice feast of blood and gore, and very scary monsters indeed, but also has a certain funny stylistic cheapness to it in the form of stop-animated clay monsters. I want to believe the original team went after a similar ludicrosity with the simplistic graphics, but it might as well be true, that the hardware restrictions didn't give much choice. Or maybe the development team wasn't very qualified to do any better. Whatever the case, this is what we have. Title screens, from left to right: BBC Micro, Commodore 64, ZX Spectrum. After the game has truly and well loaded in, we begin with a fairly basic title screen, including some of the game credits and a high scores table. Because the original utilises similar graphics engine that was used by the Teletext system, the BBC title screen isn't impressive in the least - just nostalgic for those of us who grew up with Teletext before the Internet came along. The other two look nicer, but not spectacular. Here we have a list of characters in the game, starting with Ash and his friends. Ash on the BBC is wearing green clothes, while his friends are wearing yellow. On the SPECTRUM and C64, Ash is a white hi-res monochrome sprite, while his friends are grey, but look otherwise similar. However, on the SPECTRUM, your friends have a lighter shade of grey, which makes them slightly more difficult to tell apart from yourself, if you happen to lose concentration. The whole area can be fitted into one three or four screens, but since a lot of the area outside the cabin is just black, I just included the cabin into the comparison shot above. As the differences are very little and in small amount, even the little that is different is certainly noticable. Obviously, the big difference is the dining table, which I mentioned earlier. The second most notable difference is how the swing looks on the front porch. All the rest of it is rather inconsequential, since most of the time, you will be focusing on doors, windows and the evil sprites. Somewhat similarly to Friday the 13th, your death results in a visual effect that is closely related to some loading schemes' visual outputs on the C64. The SPECTRUM version's death animation is similar to the loading screen entrance effect, although it lasts a bit longer here. Compared to these, the original death animation on the BBC MICRO is rather dull and predictable explosion, similar to all the other kills in the game. If you have managed to get yourself on the high score list, you get either a completely separate "Enter your name" screen as you do on the original, or you will type your name while seeing the title screen above the typing space. Again, this sort of thing matters not that much in the end, but it's a difference. Although there are quite a lot of aspects in The Evil Dead's graphics that I feel are more stylistically proper in the conversions, the original has a more suitable in-game feel and colouring. Also, the additional loading bits do give it some slight sense of polishing that the other two are perhaps missing. For once, I'd say the BBC version wins here, and the others come second. "Bulk" is the first word that comes to mind, when trying to describe this game's sounds. The original BBC version includes one bit of music, which is a rendition of the all too well known bit of Funeral March gone awry, which is played as a "get ready" sort of a piece when you start the game. The sound effects are not particularly interesting either, just basic bips and boops with an occasional splash of crashy noise when someone gets hacked to pieces or something. Happily, and not entirely unexpectedly, the C64 conversion features a haunting, if high-paced theme tune, which reminds me of some classical composition, the name of which escapes me at the moment. Something baroque, anyway. Even the sound effects are more effective here, as well as descriptive, which is the key word. You can hear your footsteps as nice tapping noises; doors and windows are shut with a nice bang; picking up weapons plays a particularly different kind of a "ding" effect; fighting will result in a crash-like chalky noise, and any death will trigger a short chord arpeggio based melody. Although the SPECTRUM version supports the MicroSpeech module, there isn't any difference in using one and not using one, apart from the possibility of having slightly better controllability. But the sounds stay the same. It's all just basic taps, pips, boops, and bulky bippy arpeggios. No music whatsoever. In a way, it's just as good as the original, which isn't saying much. I'm surprised, how much less I actually hate the game now, after trying it out properly on all machines. I can safely say, that it's definitely not quite as bad as it's made out to be. But it sure isn't good either. Being a very graphic horror movie, The Evil Dead would require a very graphic game adaptation in order to make any sort of sense. This one just isn't. Still, if it were 1983 now, would anyone be able to do it any other way? Having gotten this out of my hands now, I'm hoping this isn't the only game that represents the Acorn's abilities to its advantage. Any Acorn fans out there are free to offer their suggestions and opinions on the matter. For a final word, I might as well mention, that The Evil Dead has its fair share of more modern game adaptations, none of which have gotten much praise. Unfortunately, I believe this is one franchise that doesn't have the characteristics of making a good game. Just stick to the movies, that's where the real fun is. Well, that's interesting. The BBC Micro was the original platform for this game? I always thought it originated on the C64. Since I'm always interested in things like that, could you please give me an information about your source (text or link)? Well, you certainly know how to pick your questions. =) I can't offer any actual proof, but I figured it out like this: the C64 version itself presents source enough, since the text scroller during the "attract mode" tells us that Colin Tanner designed the game, and the title screen says "64 version by Richard Leinfellner". Since Colin Tanner actually programmed the BBC Micro version, wouldn't it suggest that it was the original? I'm aware that the C64 version might have been released first, but I'd say the Acorn was the original platform, if strictly spoken with design in mind. I hope the question didn‘t sound to offensive. Thanks to my bad English I sometimes can’t write like I would do it in my mother tongue. Sorry for that. Actually I’m working (since a few years) on a database that I want to use for an online 8bit museum. Unfortunately, since I have to finish another project first, the museum will have to wait. But I can always put some new information in my database, that doesn’t take much time. That’s the reason why I’m asking questions like this one. Over the time I found many things that were wrong in different sources (like books). My goal is to correct these errors. Anyway... no, the question wasn't offensive at all - I was just wondering that this was the first time anyone questioned the research for credits, and for a good reason too. I just found it funny that it had to be such a seemingly insignificant game as The Evil Dead that the question came forth. =) You write English well enough, don't worry about that; certainly better than some natives. For me, the article you linked only shows another sadly regular case of important people having a selective memory, although you can never tell. Based on all the game's versions' credits, I'd say Colin Tanner was the first one there, although now I'm thinking, perhaps he was an outsider who merely got his game published through Palace Software. Of course, you'd have to go to a reliable source to confirm any information, so Richard Leinfellner sounds like a good option. ;-) Good luck with your museum!